(CNN) -- A 2-year-old survived an attack that took the lives of his parents, thanks to a quick-thinking nanny who grabbed the boy and dashed past gunmen to safety. Sandra Samuel and Moshe Holtzberg were the only ones to survive a siege on Mumbai's Chabad House last week. 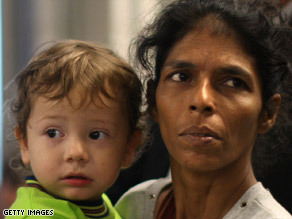 Two-year-old Moshe Holtzberg and nanny Sandra Samuel were the only ones to make it out of the Chabad House in Mumbai, India, alive after attackers stormed the house. The gunmen killed Moshe's parents, Chabad House directors Rabbi Gavriel Holtzberg and his wife, Rivka, and four others. Rivka Holtzberg, who arrived in Mumbai with her husband five years ago to serve the city's small Jewish community, was pregnant, her father said at her funeral Tuesday, the Israeli newspaper Haaretz reported. Those at the Chabad House were among 179 people killed last week when gunmen targeted several sites across Mumbai, including two luxury hotels, a train station and a hospital. "She heard Mrs. Holtzberg -- Rivka -- screaming, 'Sandra, Sandra, help, Sandra,' " said Robert Katz, executive vice president of the Israeli organization Migdal Ohr. The gunmen reportedly went door-to-door, searching for targets. Samuel unlocked her door, according to Katz. She then ran upstairs to find the Holtzbergs shot dead, lying on the ground with their son crying over them. "She literally picked him up and made a dash for the exits, almost daring the terrorists to shoot a woman carrying a baby," Katz said. The two arrived in Israel early Tuesday on a flight with the boy's maternal grandparents and the bodies of his parents. The return of the bodies was delayed until authorities removed hand grenades from the bodies, left there by the attackers, Katz said. Among those helping to provide Moshe with shelter and support is his great-uncle, Rabbi Yitzchak Dovid Grossman, founder of Migdal Ohr, Israel's largest youth village. It provides more than 6,500 "orphaned, impoverished, underprivileged and new immigrant children" with homes and education. Grossman also secured a one-year visa in Israel for Samuel to assist in caring for the boy as he transitions to his new life, Katz said in a statement on Migdal Ohr's Web site. The Holtzbergs were laid to rest Tuesday in a service that drew thousands of mourners and emissaries from the ultra-Orthodox Chabad movement to the Israeli village of Kfar Chabad, a village of 900 families just outside Tel Aviv. "Moshe, you have no living mother and father," Rabbi Moshe Kotlarsky, a Chabad official from New York, said at the ceremony, according to Haaretz. "Today you become the child of all Israel." Including the Holtzbergs, four Israelis, an American Jew and a Mexican woman were gunned down last week in the attack on Mumbai's Chabad House, a Jewish center where the couple ministered to people from the community and welcomed them to pray, eat kosher food or celebrate Jewish holidays.